we think of halloween as a time to celebrate monsters and mischief, and for kids to go door to door in search of candy — and maybe a few scares along the way. but despite all hallows' eve being a designated night for fright, the scariest thing for parents of trick-or-treaters isn't the wolf man, dracula or frankenstein — it's cars in the street. halloween should be a ghoulish good time, but the frightening fact is that it's considered the single most dangerous day of the year for child pedestrians. children age 5 to 14 are between two and four times more likely to be struck and killed by a car compared with the nightly average for a given year. unsurprisingly, the deadliest hours are from 4 p.m. to 10 p.m., when trick-or-treaters are out in full force — too often paying more attention to their costume or candy than to watching their step around traffic. with u.s. traffic fatalities spiking in recent years — particularly those involving pedestrians — this halloween is no time for parents to let their guard down. trick-or-treaters younger than 12 should be accompanied by an adult. always use sidewalks or designated walking paths and only cross at corners, keeping close watch for cars and obeying signals at crosswalks. affix reflective tape to kids' costumes, opt for more visible, light-colored costumes and have trick-or-treaters carry a flashlight or glow stick, all to ensure they can be seen by passing cars. choose face paint or at least avoid masks that obstruct a child's vision; likewise, avoid costumes that hang low near the feet, posing a tripping hazard. slow down and exercise extreme caution in residential areas, as kids are impulsive and prone to making sudden, unexpected moves. be sure your headlights are on. don't assume trick-or-treaters see your car coming. minimize distractions — seriously, you should always do this, but maybe make a special effort on this night. another suggestion for safe holiday fun? trunk-or-treating. join with friends, neighbors and fellow parents of schoolchildren to organize an event in a field, parking lot or other open space in which you dress up your parked vehicles in do-it-yourself halloween car-stumes, and have the kids go from car to car collecting candy in a safe, controlled environment that's fun for everyone. 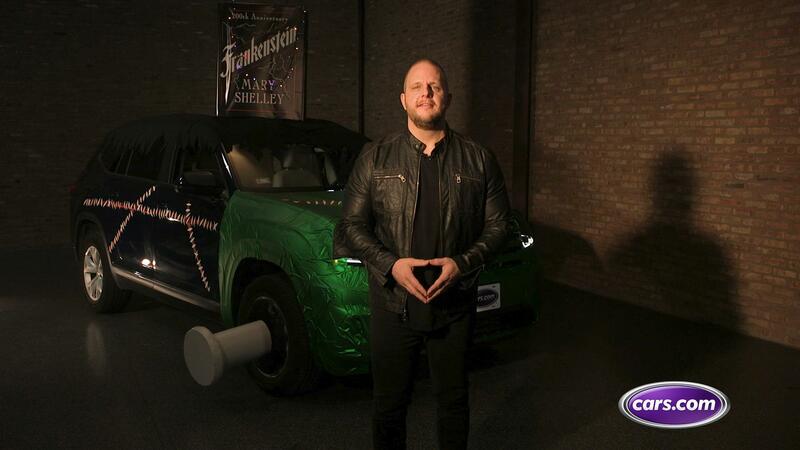 this year, dressed up our best of 2018 award-winning volkswagen atlas suv as frankenstein's monster. it's our own little tribute to the 200th anniversary of author mary shelley's gothic literary classic, "frankenstein," and just one example of what you can do to ensure a scary-safe halloween this year.